This view is from the west end of the nave up to the high altar of San Marco, with the dome of the Pentecost overhead and the dome of the Ascension beyond, partially obscured by the banner. The lives of the Apostles, with the Crucifixion of St Andrew clearly visible, decorate the underside of the arch to the left; those on the right do not match the actual mosaics. There are pentimenti in the dome of the Pentecost. The painting would seem to record a special occasion: the Doge's coats of arms, elaborately framed, decorate both sides of the nave; these were traditionally put up after the death of a doge. The candles along the top of the rood screen have been lit and garlands hang in the openings below. There are figures are in the double-tier pulpit to the left of the screen and a choir in the bigonzo on the right; the nave is filled with kneeling worshippers. In the little chapel of the Crucifix on the left of the nave is a priest in red vestments. 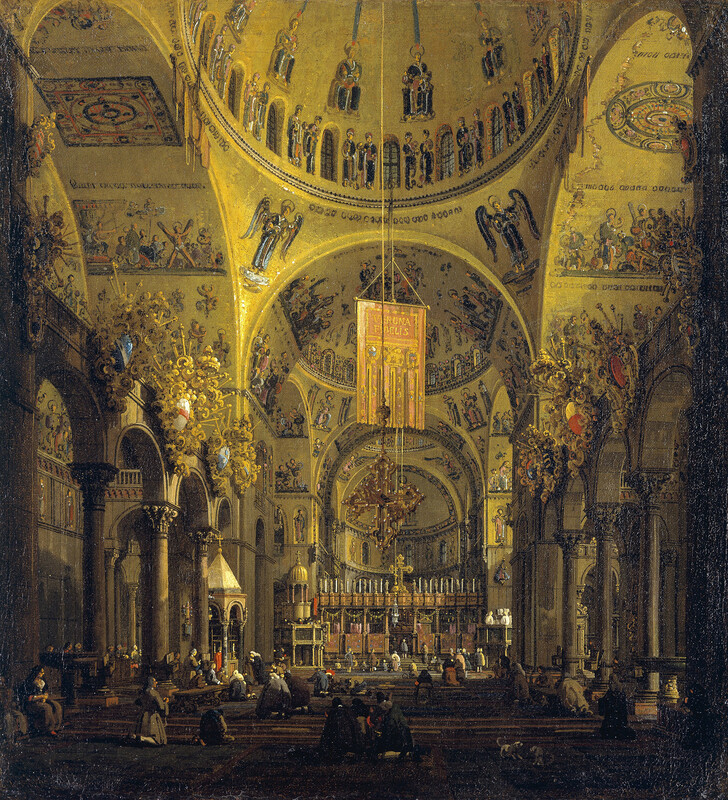 A banner of the city of Verona, pink and gold inscribed VERONA/FIDELIS, hangs from the Pentecost dome; this is flanked by hangings above that have been described as Turkish flags marking a victory in war. Morning light fills the transept from the south. The Pentecost cupola would not be visible from this viewpoint, nor would it be possible to see the recession up both sides of the nave. Compared with RCIN 400567 the view is more matter of fact and demonstrates the experienced and efficient technique of Canaletto's late brushwork: each detail is meticulously painted with black outlining, rhythmic curves and small, calligraphic touches of colour.